My apologies for the post that went out this morning. It was supposed to be finished and posted last night but family events got me sidetracked and it didn’t. So, it automatically went out this morning. This is the revised and correct version – the other has been deleted. What does Backwards Friday mean? It means I am going backwards in time to play with quilt blocks of times gone by. Each Friday, I will introduce a new block from some of the old magazines that I have laying around. I have a few hundred of them, so it will be fun to find new blocks for each Friday. I will research the block. I will write it up, the best way I know, using “modern” methods. Then, I will post the block here for y’all to play with. If you make it, please let me know. You can share pictures on my Facebook wall if you are unable to do so here. Description, cont. : “The quilt is fairly easy to piece, having long straight seams and a reasonable number of patches – 859 of them. 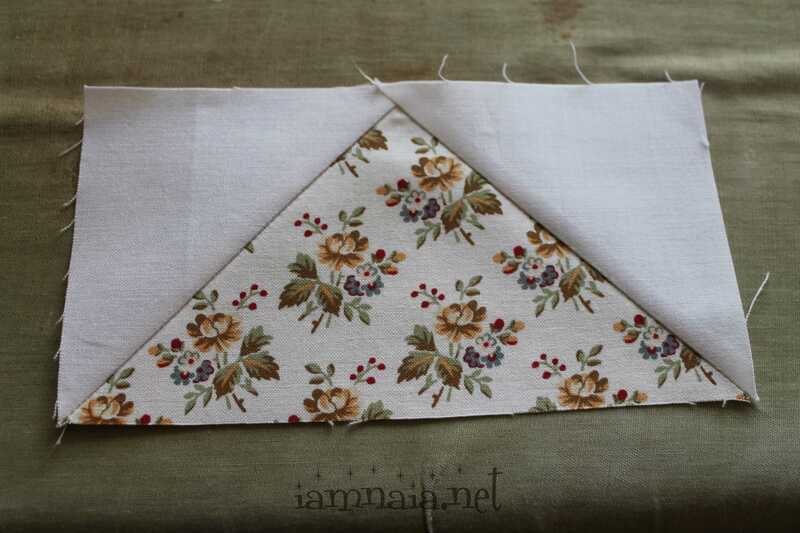 It could easily be stitched on the machine, although some quiltmakers will prefer to set int the angled patches by hand. Either method of stitching will work well for this quilt: by hand, by machine – or a combination. The rest of the description is omitted so it doesn’t give away the secret name or piecing. There will be no pictures from the magazine for the completed quilt, either. 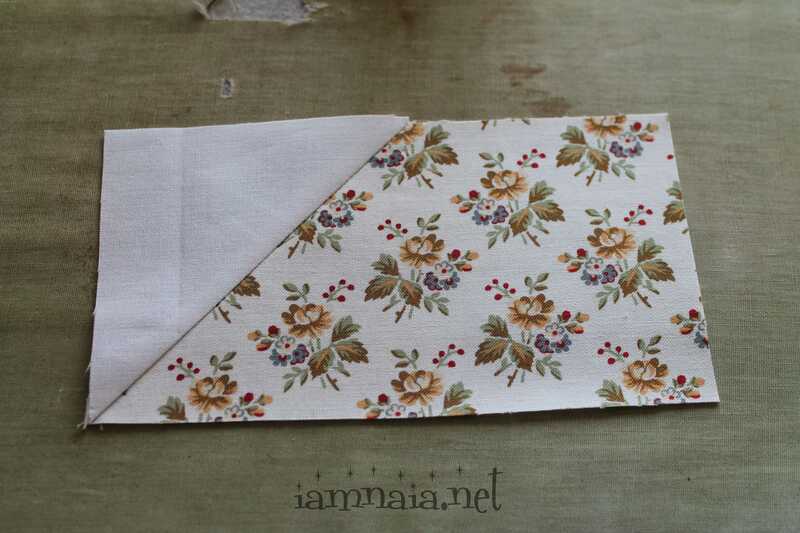 I really want this to be a secret project – not really a mystery quilt – but a secret because it is so cute when finished! I pulled scraps out of my stash and the colors are not as vivid as the original; however, it looks alright when done. I’ll give suggestions for color below. Think SPRING when choosing your own variations of the colors listed. The original is supposed to be 15 1/2″ after assembling four patched squares. 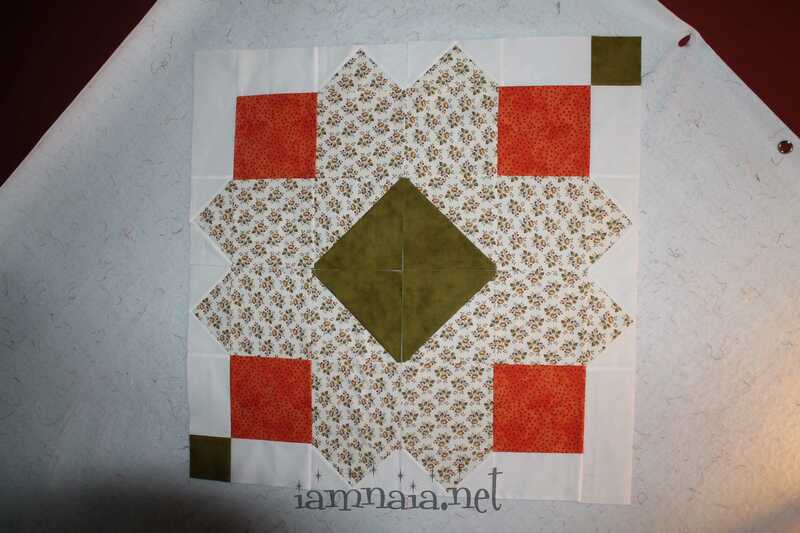 I upsized it and it will be 30 1/2″ the same four patched squares. To this end, I am going to turn this original pattern into a lap quilt instead of a full (or queen)-sized bed quilt. This will be similar to when I upsized The Lincoln Quilt. 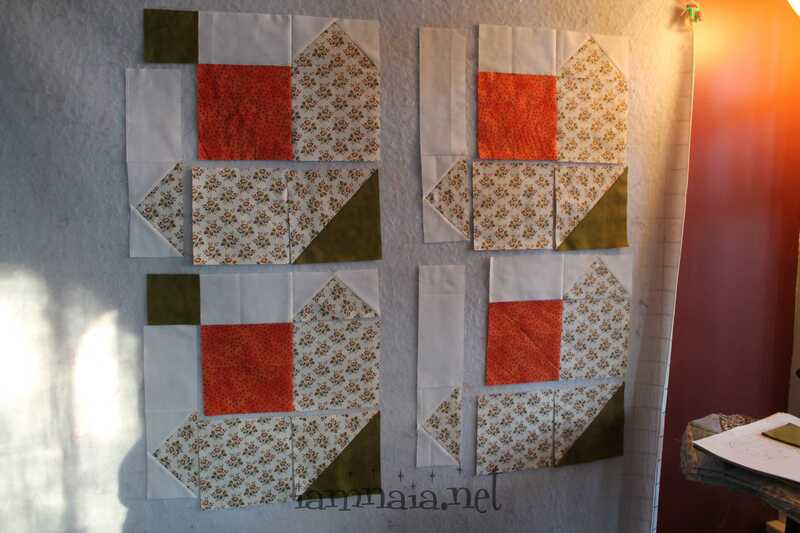 I did turn that into a queen quilt in the end; however, I upsized the original blocks for simplicity. I may turn this quilt into a smaller version – like the original – when I am done with the upsized version. Basically, we’ll see how it goes over the next four weeks. Yes, this quilt will take four weeks to make. Because I am anxious to see how others do with the patterns I rewrite/create, I am going to do a give away. The first person to show me their completed quilt at the end of the four weeks will receive a jelly roll from my stash and eight patterns (not jelly roll patterns). Trust me, I have quite a few of them and have no problem sharing to someone who actually attempts my patterns. I really do want to see someone else create what I write up, so it is definitely worth it to me! I will not be making the original quilt; however, to be safe, I would get as close to those measurements as possible. I will tell you that I did not have all that in my stash. I am trying it with just a little less than what is shown. I only have 2 yards of white, a million yards of my yellow, 2 yards of green and a yard of orange. That should give you an idea of what to do and how much to find in your own stash. The above cutting instructions will be used to assemble four squares (two different kinds, two of each kind). 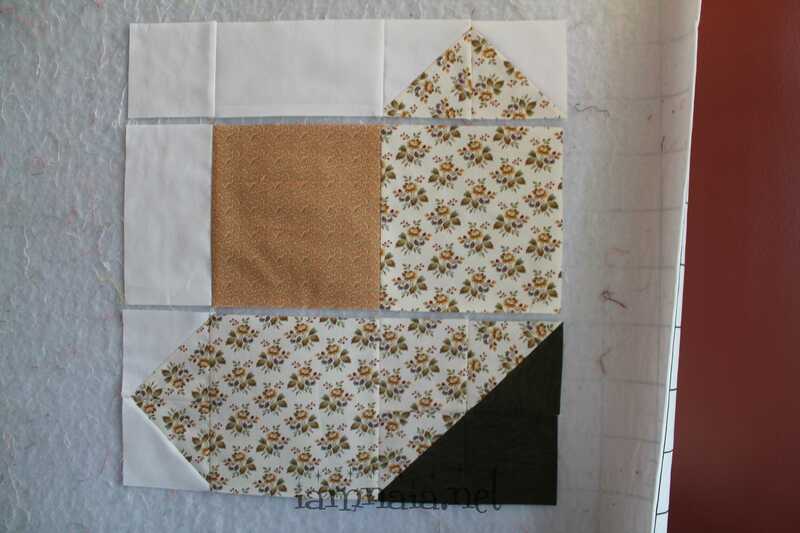 These four squares will be assembled to create one 30 1/2″ block. We’ll start by making our Flying Geese pieces. There are 8 total. For each Flying Geese, take (1) yellow 6 1/2″ x 3 1/2″ and (2) white 3 1/2″ x 3 1/2″. Draw a line diagonal on the whites and place one of them down with the diagonal as shown. It is actually upside down from what we’ll be creating. I apologize. One side of the line drawn needs to be exactly lined up with the corner of the yellow piece. The other end of the line drawn will end up halfway across the yellow. 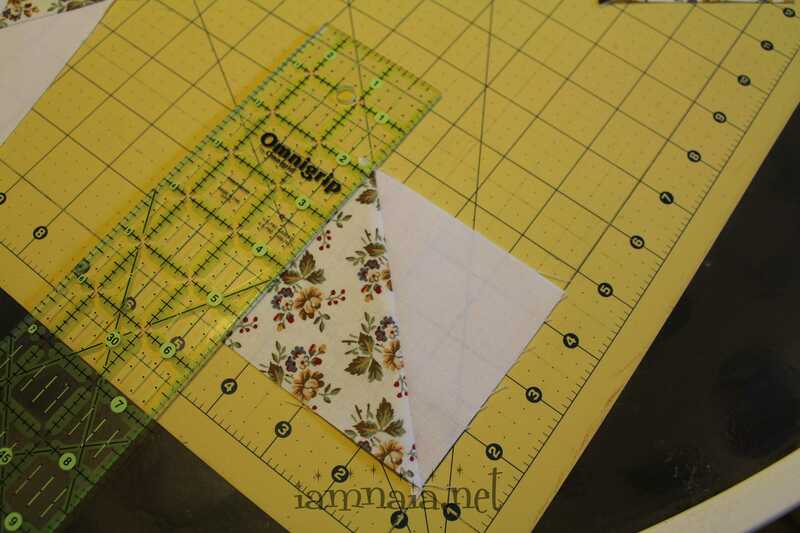 Sew on the line and then cut 1/4″ past the line. Open and iron it flat. For quick understanding of Flying Geese, you take the length of what you want and divide it in half. In this case, it is 6 1/2″ long, so my square will be 3 1/2″. The yellow is 3 1/2″ tall, so my white will be 3 1/2″ long and 3 1/2″ tall – a square. Doing this method will give perfect Flying Geese. 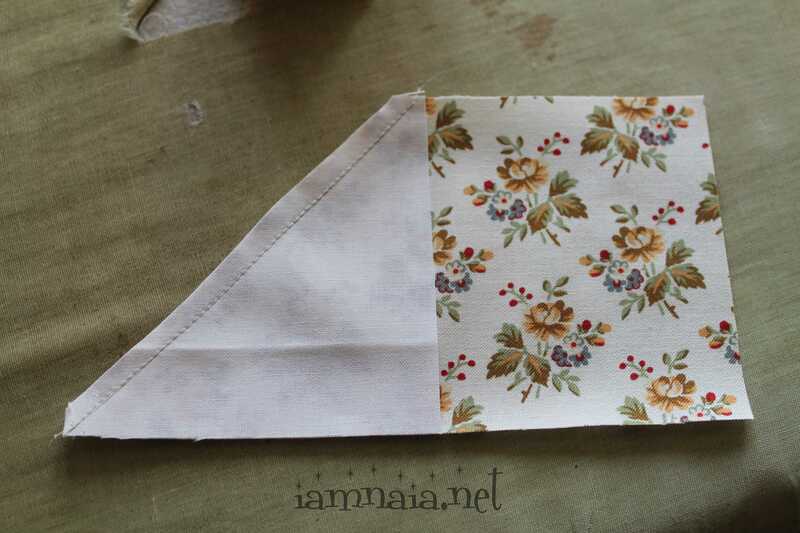 Lay the second white 3 1/2″ square on the other side of where you added the first. Sew on the line. Trim a 1/4″, open and iron flat. You will make (8) of these. Next is the HSTs. You will create (4) of these. 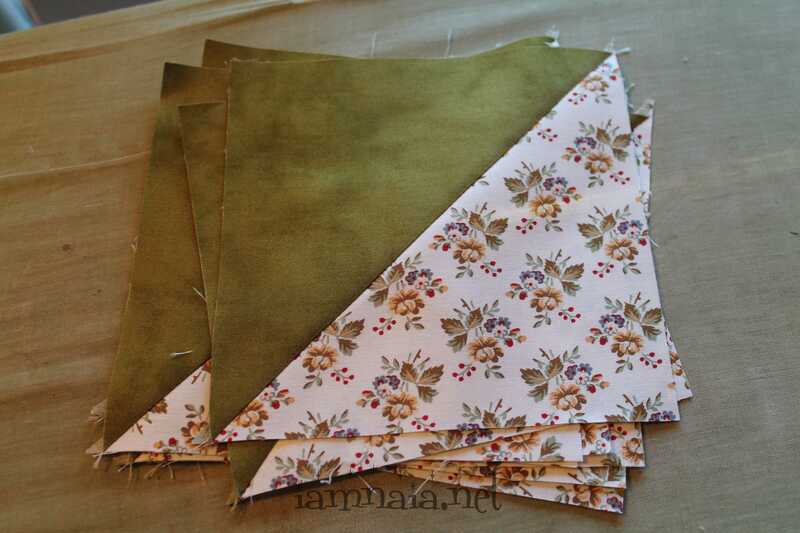 For two HSTs, take (1) 6 7/8″ yellow and (1) 6 7/8″ green. Draw a line diagonal on the backside of the yellow. 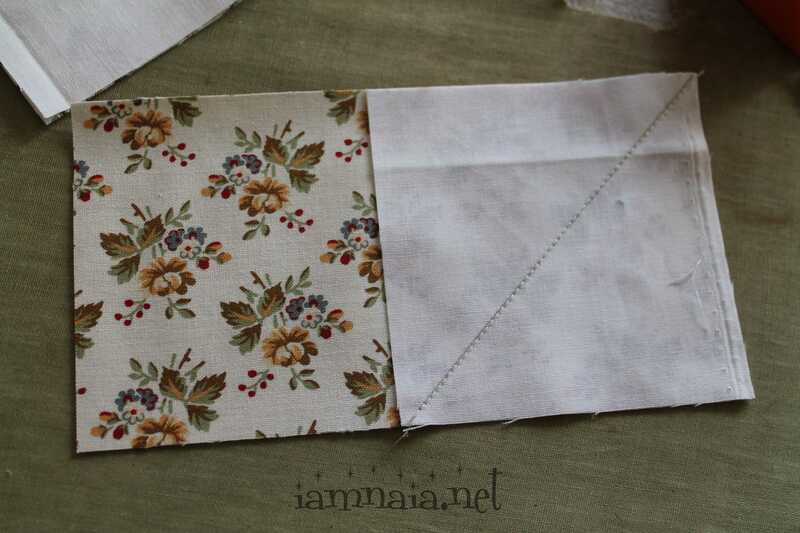 Place both right sides together, sew a 1/4″ on either side of the line (two sewn lines when done). 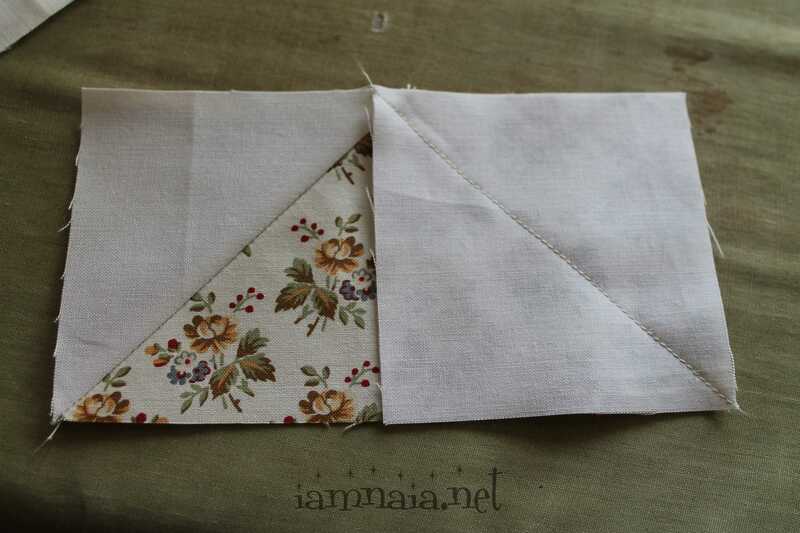 Cut ON the line to split it into TWO, open and iron flat. 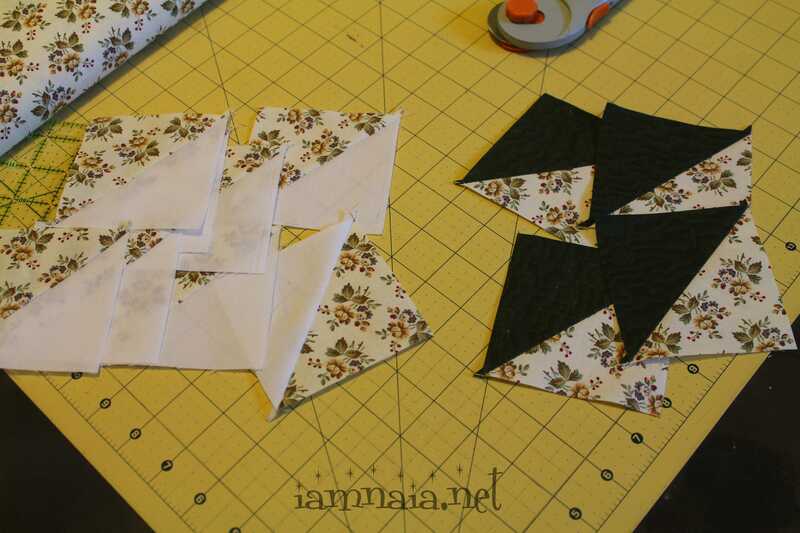 Doing this two times will create FOUR HSTs. From here, it is simply assembly. The picture above will show the two different blocks. If you need more from me, please ask. It is rather simple, though. 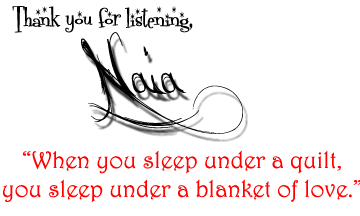 Click the picture to see a larger picture and click the back space on your computer to return to this post. 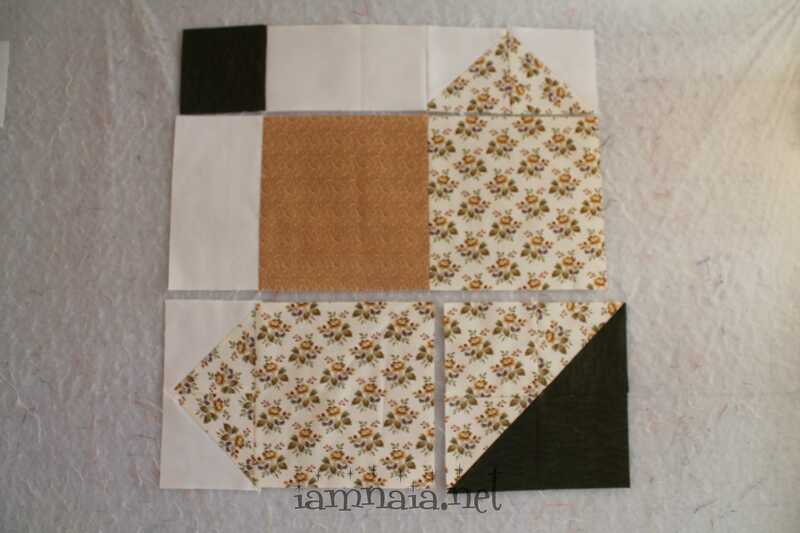 When finished your assembly, sew the four large 15 1/2″ blocks together to create the above picture. It should measure 30 1/2″ when finished. I actually created two versions of this. The first one, this with the muted orange colors, I had too many small squares. I simplified it and made the one I showed you how to do. This is the second of the two original blocks I did. I did want to caution and say this: When you make the HSTs, it is imperative that you trim them up after splitting them and ironing them. I use my cutting table for this and it makes it much easier. If you look, you’ll see the cutting mat has diagonal lines drawn. 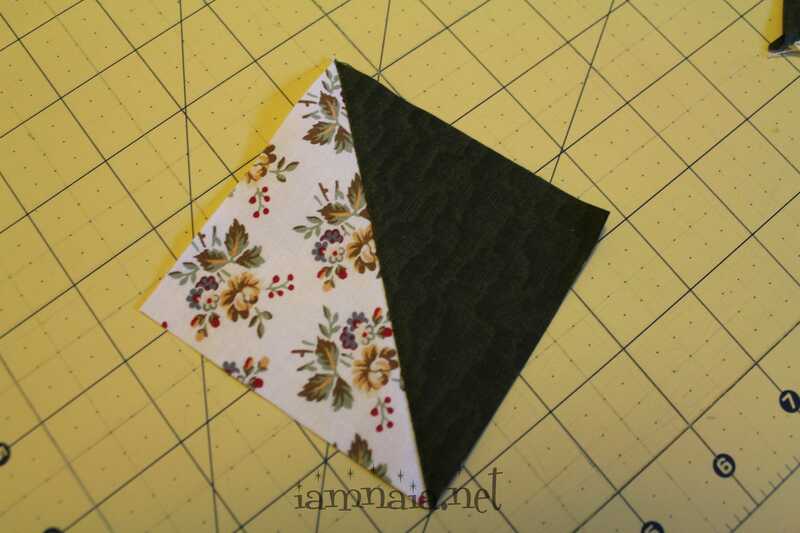 If you take your HST and lay it where the diagonal line created by the fabrics matches perfectly with the line on your cutting mat, you can trim around it (all four sides if necessary) and it will keep your points intact. It must me lined up on that diagonal line perfectly, though. Otherwise, you get a mess. Trust me, I know! When finished, a perfectly square Half Square Triangle. 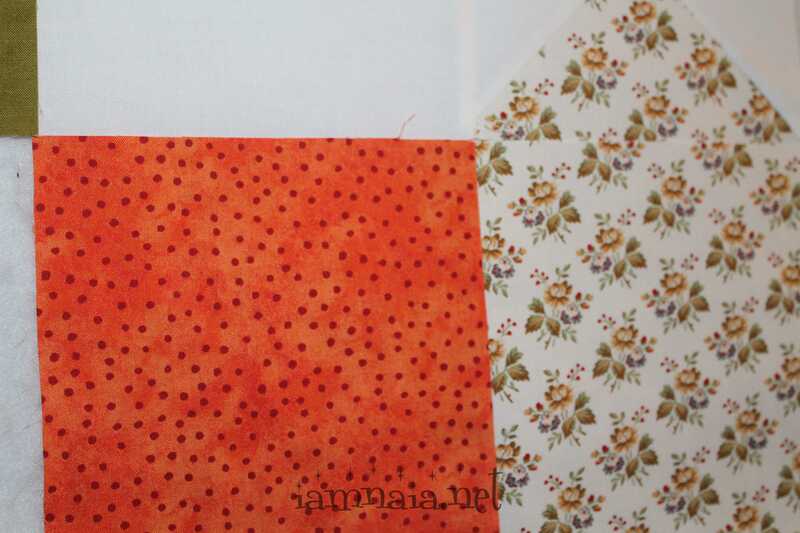 What do y’all think of the orange polka dots that Jen picked out for me for my second run through of this pattern? I keep teasing her but the grand picture looks really good with the bright orange and the muted green. Until next week. Keep in mind, this is an ongoing pattern!